Edox was founded in 1884 in the Swiss canton of Jura. Focused on the production of pocket watches till the death of its founder Christian Rüfli-Flury, Edox (which means "hour" in ancient Greek) started production of wristwatches in 1921 and become well known in the 1960s for its Delfin model, a timepiece that was water-resistant to 200 metres thanks to the double crown gasket, the double case-back and the special shock-proofing, and for the Hydro Sub, a model that was water-resistant to 500 metres. 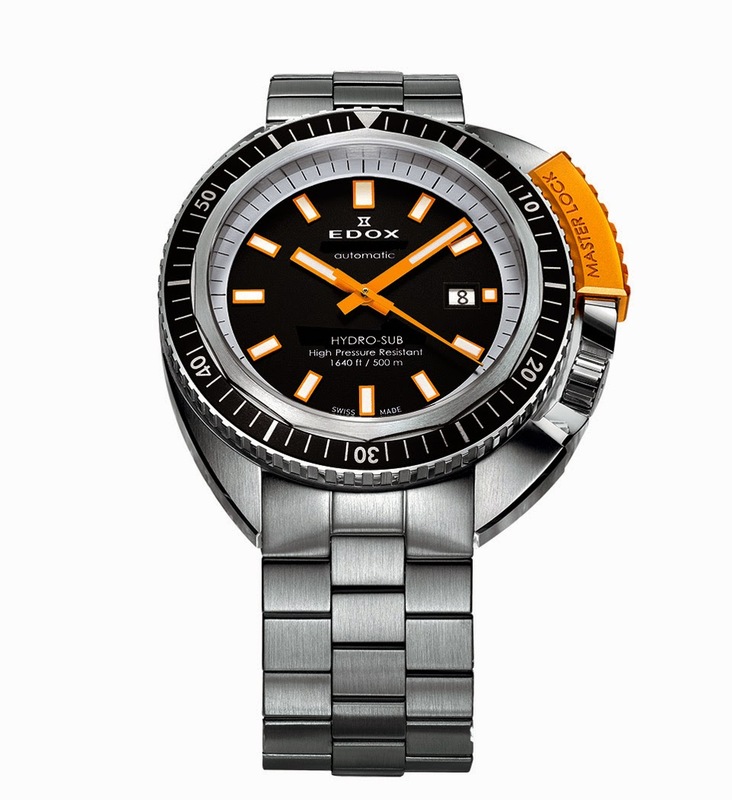 In 2014 Edox introduced the new Hydro Sub Automatic Date whose design was inspired by the 1965 model with the integration of the new, distinctive "Master Lock" crown protector system consisting in a metal protector that slides down to lock in place and protect the screw-locked crown. 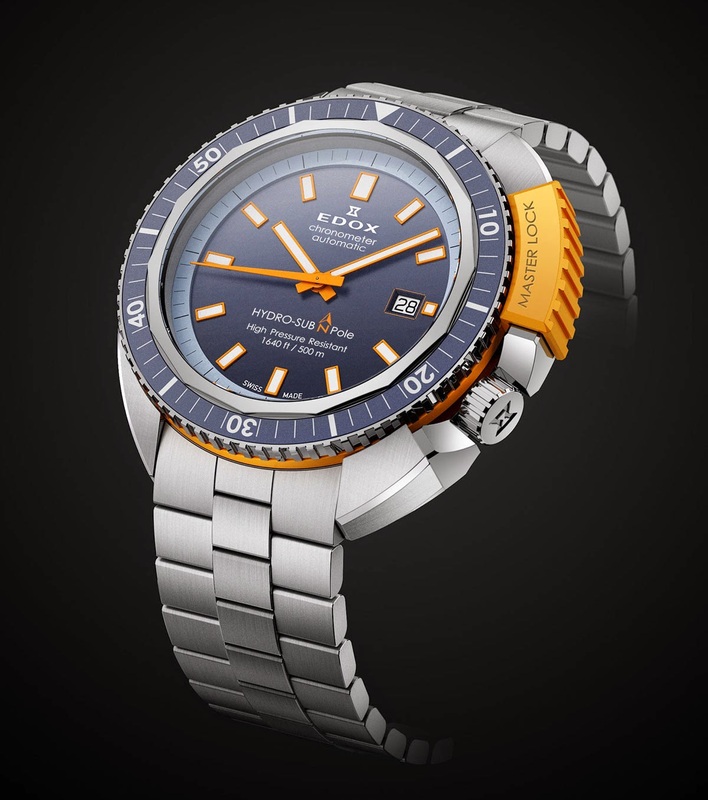 The automatic model (quartz versions are also on catalogue) is available in two main versions: black bezel, black dial, orange "Master Lock" and orange details (ref. 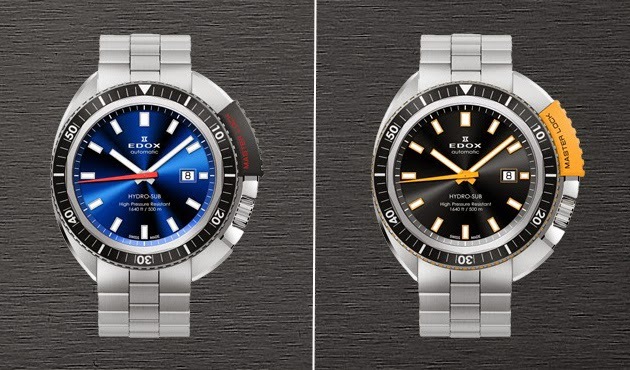 80301 3NOM NIN), and black bezel, blue dial, black "Master Lock" and red details (ref. 80301 3NOM BUIN). 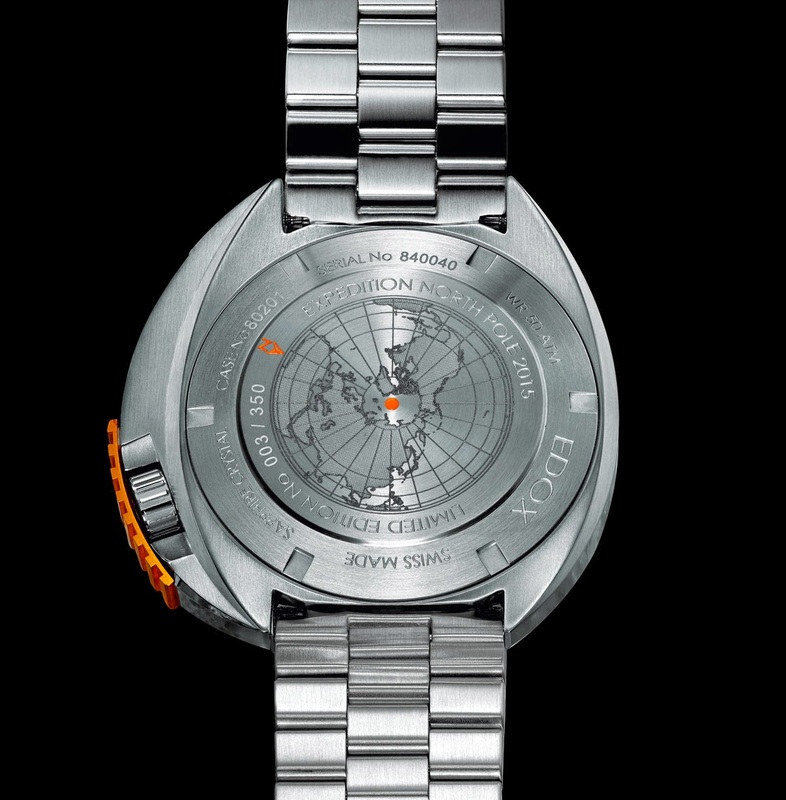 A third version, produced in just 350 pieces, is dedicated to the North Pole expedition that will see Christian Redl (world record holder in free diving) and photographer Marcus Fillinger trying to reach the geographic north pole in April 2015. Redl will attempt to be the first man to free dive under the ice of the North Pole, of course with the Hydro-Sub on his wrist. 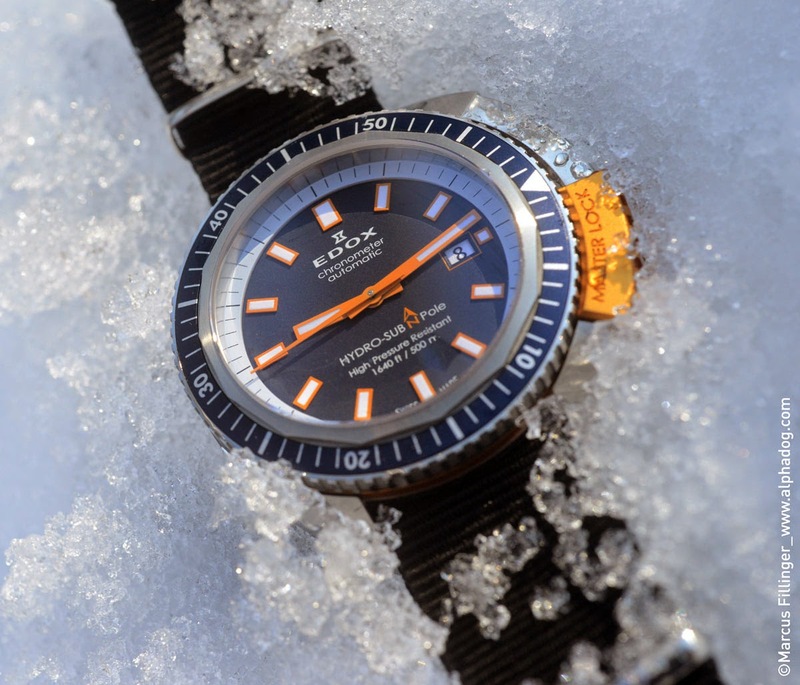 The Hydro Sub North Pole Mission Limited Edition (ref. 80201 3BUO BU) is characterised by the blue tones used for the bezel and the dial which create a beautiful contrast with the orange details. 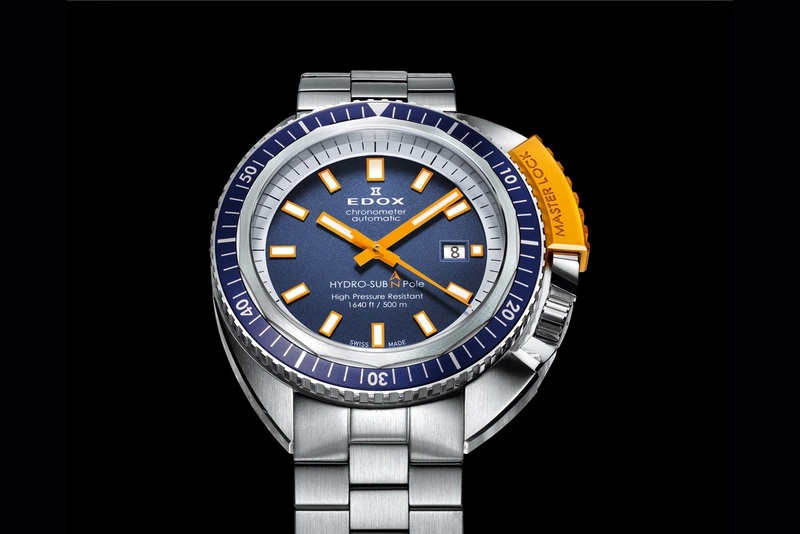 Conceived as a professional tool for the most challenging conditions, the Hydro Sub Automatic Date has a cushion-shaped stainless steel case with an imposing diameter of 46 mm (49 mm if you consider the crown protector) and it is powered by a chronometer-certified self-winding movement (the Edox Calibre 80, based on an ETA 2824). The thick gasket sealed sapphire crystal, the solid screwed-in caseback, and the screwed-down crown with double o-ring ensure water resistance to 500 metres.